As a pet owner, and especially if you’re a dog owner, you probably know chocolate can be poisonous to your furry friends. With Halloween just days away, pet owners and veterinary professionals alike will be entering an unofficial season — chocolate season. It’s that time of year, stretching from Halloween through Christmas, Valentine’s Day and Easter, when large amounts of chocolatey deliciousness are found in many homes. While chocolate is definitely on the list of foods that should never be given to your pet, you also don’t want to overreact if your dog or cat has eaten some. Here we’ll look at what makes chocolate dangerous to our pets, which types of chocolate are more dangerous than others, and whether eating chocolate really can be deadly to your dog. The key to chocolate’s deadliness is two compounds — caffeine and theobromine. Of the two, theobromine is the greater issue. Both dogs and cats are very sensitive to the effects of theobromine and caffeine, which are rapidly absorbed through the digestive system. These compounds also can be reabsorbed from the small intestine and across the bladder wall, and returned to the bloodstream to recirculate again. Chocolate poisoning tends to be more of a problem in dogs, primarily because cats aren’t usually attracted to chocolate. Plus, cats tend to be finickier about what they eat compared to many dogs, who will eat almost anything and as much as they can. So why don’t people have a problem with eating chocolate? According to the Canadian Veterinary Medical Association, studies have shown that dogs (and probably cats) have a slow rate of theobromine metabolism. In other words, your dog’s body breaks down theobromine more slowly than yours, which causes theobromine to stay in the dog’s bloodstream longer and gives it more time to accumulate to harmful levels. Are some types of chocolate more dangerous than others? Absolutely! The amounts of theobromine and caffeine in chocolate vary with the type of chocolate. The darker and more bitter the chocolate, the more dangerous it is to your dog. For example, unsweetened baking chocolate contains almost seven times more theobromine than does milk chocolate. So of the various types of chocolate you may have in your home, dry cocoa powder, unsweetened baking chocolate and dark chocolate are more dangerous than milk or white chocolate. Yes, eating chocolate can be deadly for your dog, but it depends on the amount and type of chocolate eaten and your pet’s size. For example, if your 60-pound Labrador retriever eats a 1.5-ounce Hershey’s Milk Chocolate bar, he or she may only experience mild stomach upset — if that. But if your 10-pound Yorkie mix snacks on a 1.5-ounce Hershey’s Special Dark chocolate bar, you’ll want to contact your veterinarian right away. What are the signs of chocolate poisoning in dogs? Signs of chocolate toxicity will depend on the amount and type of chocolate ingested, and can range from simple stomach upset to life-threatening problems. For many dogs, the most common signs are increased thirst, vomiting, diarrhea, panting and restlessness or hyperactivity. However, with larger ingestions, signs can include a racing heart rate, irregular heart rhythm, muscle spasms (tremors) and even seizures. 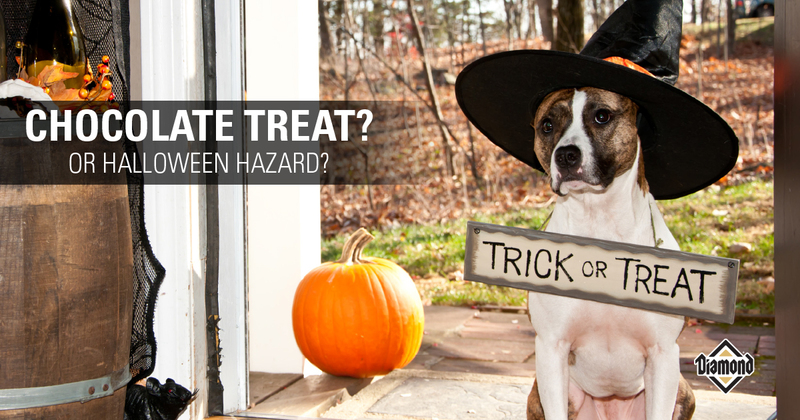 If you think your dog has eaten chocolate, don’t wait for symptoms or signs to appear. While signs can be seen as early as an hour after ingestion, they can take six to 12 hours to show up. If you think your pet has eaten chocolate, call your veterinarian, an emergency clinic or an animal poison control helpline immediately. Based on your pet’s weight and an estimate of the amount and type of chocolate consumed, a veterinary professional may be able to determine how much theobromine and caffeine was ingested, whether your dog is at risk for poisoning, and if a trip to the veterinary hospital is necessary.